Autumn leaves fall. A cup of coffee cools near a window in the winter. And Ian Bogost has done something risky. He's made four minuscule games for a dead gaming machine. And he's called these video games "poems." In a world of multi-gigabyte iPhones and video games so technologically advanced they can be confused with blockbuster movies, science fiction or real life, Ian Bogost has created a wisp of counterbalance. 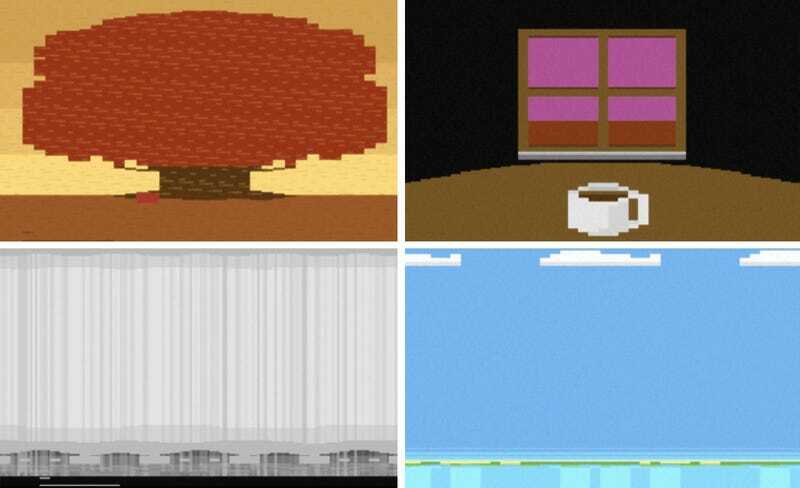 The video game developer and Georgia Tech professor has made A Slow Year, a quartet of games sold as poetry, each game based on one of the fours seasons, each one a tiny kilobyte in size and designed for the old Atari 2600, a video game console that was nearing its twilight a quarter of a century ago. "This is maybe the riskiest game that I've done," Bogost said in a telephone interview with Kotaku. It's riskier than the games he says he got death threats for, riskier than the ones that produced hate mail, riskier than his satirical games about boredom at Kinko's or airport security or Cow Clicker, his Facebook game that mockingly out-simplifies the simple but ubiquitous FarmVille. These games were made with the understanding that poetry can resist being obvious, that it can be expressive within tight constraints. A Slow Year is risky because it is many things that most new video games aren't. It's not just a compilation of four games that are each about six million times smaller than 2010's hit western Red Dead Redemption or the juggernaut Call of Duty: Black Ops. It's that they are slow, gentle, practically inscrutable games. They are the the first video game poetry Ian Bogost, self-confessed occasional writer of bad poetry, has ever programmed — possibly the first intentional video game poetry anyone has ever made, at least for an Atari 2600. The games are simple, introduced to us who have no standards with which to judge the quality of video game poems. The A Slow Year games were made with the understanding that poetry can resist being obvious, that it can be expressive within tight constraints, that it can, like a video game, challenge its reader to work through it, that it can be vague but specific, harsh yet beautiful. The autumn game is just a slow game of waiting for a leaf to fall off a tree and catching it right on time. The spring game's goal is to match thunder with lightning in a rainstorm. The summer game is the simple but daunting challenge to take a proper nap, a first-person game seen from behind drooping eyelids. Each game was made to run on the Atari but will run on Windows or Macintosh computers. Each is tough and accompanied with only a haiku for instructions. These games are neither obvious nor exciting in the way video games that are exciting usually are. Their prevailing aesthetic is one of lovely lethargy; their primary mode of play involves watching and waiting for the leaf to fall, for the coffee to cool, for the storm to crack. "They're real games and they're hard," Bogost said, who is wary of someone mistaking his creations for concept art or "net art crap" you just stare at. Like many a good poem, he suspects, their reader or player may not have them figured out at first pass. "Maybe these will be things that sort of well up later," he said. "That's kind of the same experience you have with poetry. You read it. You don't know why you're reading it. You're reading it because you were assigned it in a college class or you're bored or you like poetry and you are reading some new poetry, and it doesn't really do its work for you right away. It kind of cashes out later. You see something or have an experience and this line or this theme or this image from a poem kind of rushes back to you and helps you think through this thing you're experiencing." "In poetry, the readers' eyes pass over the words that once animated the poet's ideas and experiences.. In videogames, the player's hands operate the lost instruments of the designer's tiny secret society." A Slow Year can be mistaken for a book. It is sold as a softcover book with a cover based on Atari cartridge design and a spine that informs a bookseller or librarian to shelve this book that happens to have a CD in it with a quartet of games in the poetry section. (The book contains short chapters about game poetry, and these games as well as "machine poems" — computer generated poems that total 1 kilobyte's worth of words each). In the introduction to the book part of A Slow Year Bogost explains that what so many people have done while playing video games has been to do some of the same work done by readers of poetry. "In poetry, the readers' eyes pass over the words that once animated the poet's ideas and experiences," he wrote. "The mind assembles them into scenarios, which it then animates in secret. In videogames, the player's hands operate the lost instruments of the designer's tiny secret society. A player is the archaeologist of the lost civilization that is the game's creator." Ian Bogost couldn't tell me how a video game poem could rhyme, though, of course, rhyming isn't essential for poetry. Meter is more that matters, he believes. Meter is rhythm and structure, one that can go unnoticed in better poetry. That subtle sense of meter can be evoked by video games, he ventured. Atari video games would be ideal for it, he thought. "The whole idea of the Atari just feels like poetry to me," he said, reveling in "its constrained technical architecture, the way you program it, even the form of the assembly code on the screen — these long thin codes of data." He loves the simplicity of the Atari machine and its limitations that put him as a game creator in the mode of making a finely crafted and indirectly expressive work in the manner of crafting a haiku or a sonnet. "It's certainly a very loose analogy," he admitted of the idea of an Atari 2600 as poetic parchment. "You wouldn't want to hear somebody read Atari assembly code in a poetry jam." One creates a video game about space marines in war or a challenger to Wii Sports if one is expecting to make a hit game. One lowers expectations if their muse compels them to make something that is the equivalent not just of writing a video game poem but of doing it for this primitive Atari standard is like writing one's video game poem in Latin. "You don't expect to be living large, driving your Bentley, from making your poetry," Bogost remarked. Against the winds of technological advance, Bogost looks to A Slow Year to suggest a different direction. "When we consume games, when we talk about games, when we make games, we're being sold this line — this line about technological advancement, that things are always getting better," he said. "We want more. Here's the new version of the old hardware. And here's the new interface for the old hardware. Here's the new game that's bigger and badasser than the last game, that's the next number in sequence after the franchise name in its title. "If I can get under people's skin and make them wonder: 'Is that what I want? Or am I being duped?' then that would be a real gratifying seed to plant. And whether that takes the form of 'I'm going to go out to make game poems or maybe I'll go drag out the old NES and see what that felt like — or maybe make me feel like maybe I don't need the fancy new gizmo interface maybe I'm more interested in this other way of playing — that's ok. I would feel gratified if I gave people that pause." Ian Bogost has made video game poems. They're here to slow us all down.